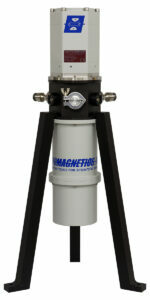 5 Tesla Table-Top Magnet System - Cryomagnetics, inc.
Table-Top 5 Tesla Cryogen-FREE superconducting magnet system ideal for Hall Effect measurements. The magnet and cryostat are cooled via low vibration pulse tube cryocooler. Access to customer supplied sample mount is achieved by removing cryostat tail section and intermediate shield. 5 Tesla field, 0.10% Homogeneity over 1cm DSV. Low Vibration 0.5Watt Cryomech Pulse Tube Cryocooler.